How to repair sinks inside granite kitchen tops effectively? Granite can be freely used for almost all types of installations inside kitchens, be it as island, countertop, backsplash or sink. Like other installations, granite kitchen tops and sink also look quite amazing, but while using it, one should always be little cautious. Though granite is a strong and durable construction material, it is brittle and might crack if not handled properly. 1. Cleaning the Sink: Before starting the repair work, it is necessary to properly clean up the entire sink. While doing so, you should also remove minor stains and scratches from the granite sink. For cleaning, spread some diamond scouring powder over the granite sink and then gently rub a soft moist cloth all over the surface of the sink. This will allow you to take off water spots and grime, in addition to stains and scratches on the granite sink. 2. Scrubbing the Granite Sink: Rinse all the scouring powder and completely wipe off the remaining moisture. In case you still find any scratch or stain, you can make use of a kitchen scrubbing pad of finest grade. Lightly press the pad against the granite sink and rub all along the stained or scratched area. After this, rinse the entire sink and allow it to dry. 3. Filling the Crack: Once the granite sink is cleaned, you will now be able to observe the crack clearly. After the sink gets completely dry, it’s time to start with the crack repair. Black epoxy filler is required to serve the purpose. For preparing the epoxy, it is suggested to follow the manufacturer’s instructional manual. Epoxy filler is applicable to large or deep cracks and can be used in small cracks only when they turn large. While applying the epoxy filler into the cracks, the challenging part is to level and smooth the epoxy filler with the rest of the granite sink surface. This can be sorted out with the help of a spatula with which, you can easily develop an even and smoothly leveled surface. Putting a tape around the crack before leveling will ease the overall task. After smoothening, allow the epoxy to rest for some time. Your sink is now free of cracks, stains and scratches and can be used as before. 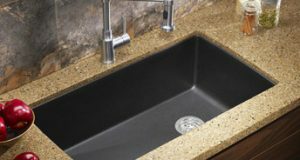 With a little care and timely maintenance, you can be assured of long life and damage-free status of your granite sink. Owing to its natural looks, it easily blends with other granite installations as well as various other elements inside kitchens. 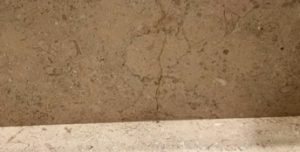 In case you are looking out for any granite product, one name that can trust upon is the 17-year-old Regatta Granites India, which is a leading granite supplier and exporter from India. Offering more than 100 different varieties of granite in different designs, sizes, finishes and styles; Regatta ensures dedicated customer service, high product quality, safe transportation and on time delivery.